This article is about the tree from Yoshi's Story. For the Super Smash Bros. stage in which it appears, see Super Happy Tree (stage). The Super Happy Tree (sometimes known as the Marvelous Tree of Mirth) is a tree that is only found on Yoshi's Island during the events of the game, Yoshi's Story. 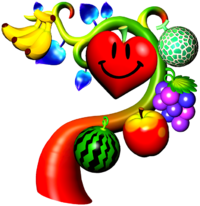 It grows every type of fruit available on the island, including the magical Heart Fruit. It is the ultimate source of all the Yoshis' happiness on Yoshi's Island. Baby Bowser steals the Super Happy Tree for its power, but the baby Yoshis later reclaim it. Baby Bowser later claims that it tasted rotten to him anyway. It later appears in Super Smash Bros., Super Smash Bros. Melee and Super Smash Bros. Ultimate in the background of the stage of the same name. It also makes a cameo in the background of Yoshi Park during Mario Superstar Baseball. It also appears as a spirit in Super Smash Bros. Ultimate. ↑ iQue. 耀西故事. Retrieved December 6, 2016. This page was last edited on February 19, 2019, at 15:45.